It's the pom-poms that really make this outfit. 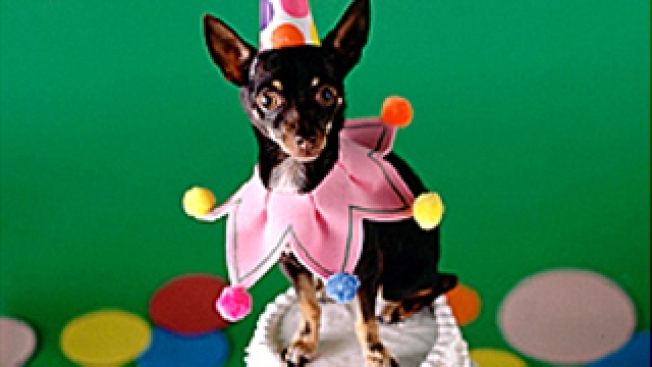 We don't officially condone dressing up your dog in a foofy outfit and parading him or her around at the 4th Annual Barking Beauty Pageant. That said, the event at Richmond Shepard Theatre benefits animal charities. And there's a talent portion. And two fashion shows. And chihuahuas in haute couture. We're not made of wood, people. Sunday, 4PM. The fabulosity of the 23rd Annual Night of a Thousand Gowns should not be underestimated. This event -- which benefits NYC's homeless teens -- has Elton John as a chair. Do you have enough sequins to attend? Saturday, 10PM. The Harlem Gospel Choir fetes Aretha Franklin's birthday at B.B. King's with a tribute show packed full of classic tunes from the Queen of Soul. We really hope they all take the stage wearing a giant, grey, bow-motif, bedazzled hat. That's our birthday wish. Sunday, 8PM. Don't forget that this Sunday is your last chance to eat Roquefort cheese before Bush's import duty on luxury Eurofoods kicks in (unless you're happy paying around $50 a pound for the stuff, in which case, have at it). Murray's Cheese will be serving it up at their Au Revoir Roquefort party. Sunday, 2PM. You + all you can eat clam chowder = the First Annual NYC Chowder Slam, Jimmy's No. 43, Saturday, 12PM. You + all you can eat mac and cheese = the Great Greenpoint Mac-Off, Sunday, Redstar bar, 4PM.